Bear Hunting and Bowfishing: The perfect combo hunt! Many people like to take in some fishing on a Canadian bear hunt, but did you realize there are places you can go that offer fantastic bowfishing opportunities on a bear hunt? Ask any bear hunting outfitter across central Canada about the most asked questions they get from prospective clients, and they will tell you that near the top of the list is the query about what to do during the day while waiting for the evening hunt. 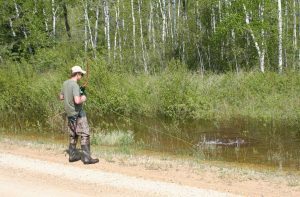 Most hunters like to fish, so that’s the number one option offered by outfitters. But there is another option available in central Manitoba. Several outfitters have been offering bowfishing combos with bear hunts as the interest in bowfishing is growing across North America. To set this up, you must first understand the terrain of Central Manitoba. It’s so flat, the saying goes that if you can’t see over something, it must be manmade. Millions of square miles of shallow lakes, swamps and lowland forest characterize this region. Lake Manitoba, for example, is 130 miles long, 30 miles wide at its widest point, and is almost entirely less than eight feet deep. It’s well known as perfect black bear habitat and dozens of outfitters fill their camps with eager bear hunters each year. But it’s also home to carp. The common carp is an invasive species imported from Europe in the early 1900s. The bottomfeeders colonized most of Manitoba’s shallow lakes and have thrived in this environment. At one time, a booming commercial fishing business centered around these carp, millions of pounds were harvested every year. But the markets for carp have waned and populations are very high. Carp are one of the most sought-after rough fish targeted by bowfishermen throughout North America. 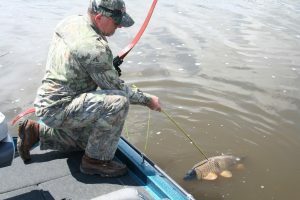 They move shallow in the spring and are vulnerable to bowfishing enthusiasts who enjoy the challenge of seeing the carp in the shallows, then sneaking within bow range either on foot or in a boat. This shallow movement just happens to coincide with the spring bear hunting season in Manitoba. I have enjoyed the amazing combination of bear hunting and carp shooting at two Manitoba outfitters and I would like to share what I have learned. The first was at Narrows Outfitters on the shores of Lake Manitoba, the second was at Bear Track Outfitters which operates out of a camp on Lake St. Martin. Narrows Outfitters takes the name from the location, the only narrow spot on 130-mile long Lake Manitoba. A bridge spans the lake at this point, and outfitter Blair Olafson’s hunting concession allows him to have bait sites on both sides of the lake. The eastern side of the lake has a large population of black bears, many of which feature the white chest blaze. The west side of the lake produces a good number of bears in colors other than black. It’s a great situation for an outfitter to be in, and of course his hunters can choose which option they prefer. Narrows Outfitters is right on the water, so my son Dawson and I took my Ranger boat along on this hunt. I had some great walleye fishing within sight of the resort, but the carp shooting was what we both remember the most fondly. We would use the boat to work our way into shallow bays and then observe carp that were working along the shoreline bulrushes and cattails. With the electric motor, we would sneak over and shoot the carp. Soon, we figured the areas where the carp were most likely to surface and just waited them out. We didn’t have to wait long, and we shot so many carp we really didn’t know what to do with them all. We put some on the bear baits and just returned some to the environment for the turtles and other organisms to feed on. We did shoot some carp from shore as well, but this hunt was best accomplished with a boat. The bear hunting package includes the use of a boat, but I would suggest bringing along an electric motor for stealth. We shot carp from the edges of the road, we waded fields and even shot carp that were skittering across the lawn at the resort. A boat wasn’t needed, the carp were everywhere, all we had to do was sneak around the shallows of the lake and shoot fish until our arrow tips were all destroyed. The Interlake region of Manitoba has long been home to fantastic bear hunting—we were successful in shooting a bear on both of these trips–but the carp shooting is just catching on. As bowhunting continues to grow, I suspect more outfitters who have carp shooting available to them will begin to offer these packages. 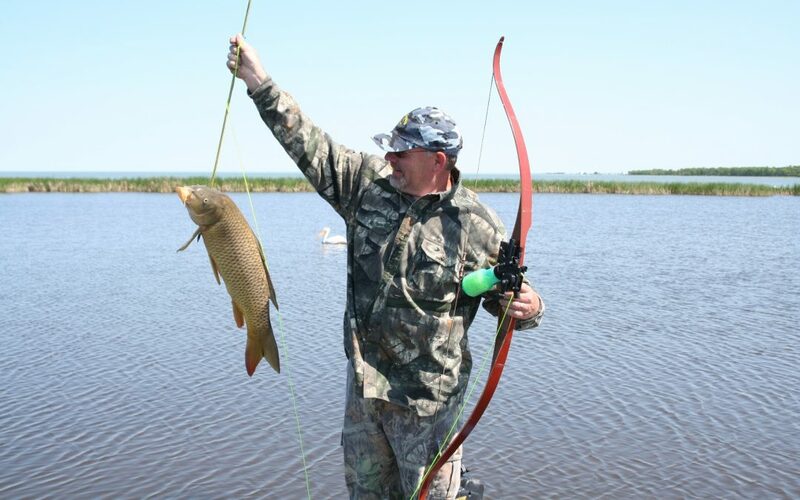 In the meantime, if you like bowfishing, or would just like to try something different, combine a bear hunt with carp shooting for some of the most fun imaginable. And you will be doing a service to the area by removing some of these troublesome invasive fish. I love the idea of bowfishing on a bear hunt. I will check out Bear track outfitters and/or narrow outfitters. I got some bowfishing equiptment from http://www.prolinebowstrings.com recently and have been trying to get into it more but haven’t had the time. Thanks for the great post share.